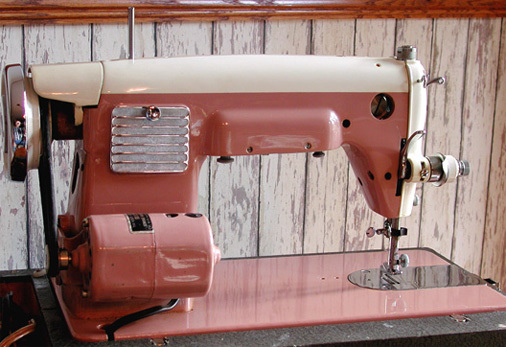 This is a Universal De Luxe Streamliner Sewing Machine Model DST. Tension adjustment is on the far side of the machine. 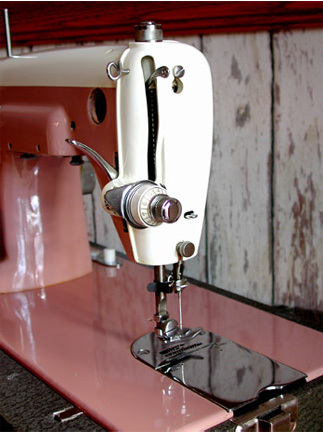 Once the upper thread tension is adjusted, the adjustment control is out of the way. It is pink in color meaning it probably was made sometime during the 50s. Serial number of this machine is A34 C77228. JC30 is cast into the base. It appears the cream-colored top is removable, however it isn't. This complicates lubrication which is accomplished by rolling the machine around quite a bit so oil can be dropped onto all moving parts which are tucked away behind the metal casting. The access door on the back of the machine is removed for access to points which require oil. Additionally, the large hole in the front of the machine is there to provide lubrication and maintenance access. The machine sews forward and reverse as well as having the ability to lower the feed dogs. Pressing the button marked "R" causes the machine to sew in reverse. Depressing a white button on the base causes the feed dogs to lower . The fabric can then be manipulated under the needle as desired. 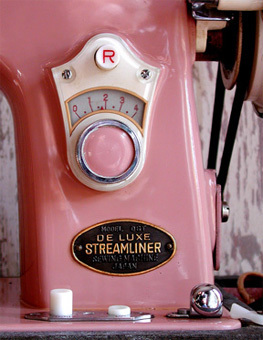 The large pink dial and indicator is the stitch length regulator. Threading the Universal DST is much like our Singers and other badged machines. 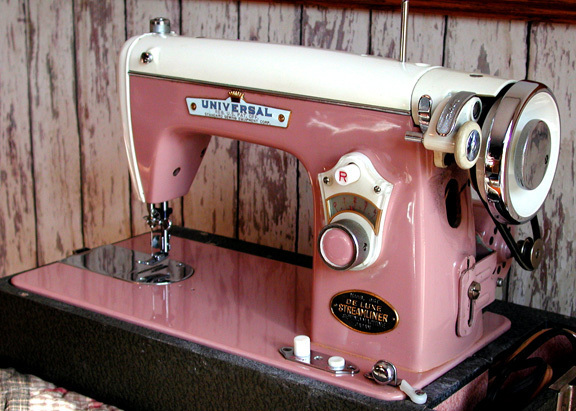 The upper thread tension adjustment is on the back side which requires one to reach over the top and around the front of the machine to thread it; however once this is accomplished, the upper thread tension device is out of the operator's way.